Dr. Avisheh Forouzesh always appreciates feedback from her valued patients. To date, we’re thrilled to have collected 10 reviews with an average rating of 5 out of 5 stars. 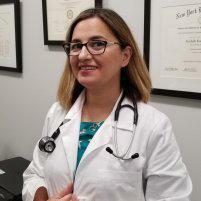 Please read what others are saying about Dr. Avisheh Forouzesh below, and as always, we would love to collect your feedback. As always, I love going in to see her. She makes me feel super comfortable and relaxed with her knowledge! Dr. Forouzesh was super helpful, thorough and knowledgable! I had a great experience with Dr. Avisheh. She was very professional, kind and informative. I would definitely recommend Dr. Avisheh to anyone needing this type of specialist. You will be in great hands . Very nice and thorough. Explained simple and repeated when necessary. I've been going to Dr. Farouzesh for almost 2 years ever since I got diagnosed that requires her expertise to treat. I am very satisfied with the care she gives me and confident that my medical condition will continue to get better under her guidance. Dr. Forouzesh has been my doctor since 2014. She is attentive, super smart, passionate, caring and so much more. She takes her time with me, calls me to follow up labs, gives me educated insight and awesome advice. We have developed such a great relationship. Highly recommend! Dr. Forouzesh took the time to fully evaluate me and listen to my story. So nice to be heard! Very detailed in analysis and spends a lot of time with the patient to hear the complete history of illness and provides treatment. In my case I was on a short business travel to US and hence without much history, she had taken a lot more time to completely understand my case. I have been Dr. Forouzesh’s patient for many years. She is a great doctor and a kind listener. I’ve never felt rushed since she takes her time and she gives you all the attention you need. She also gives the accurate diagnoses so you don’t need a second opinion. She is a committed doctor and I’m so glad to have her as my physician.